It's hard to believe that we are already out of the newborn stage. I say it all the time, but it really feels like just yesterday she was still in my belly and I was doing anything and everything I could to get her to come out. I can't believe she will turn four months next week! 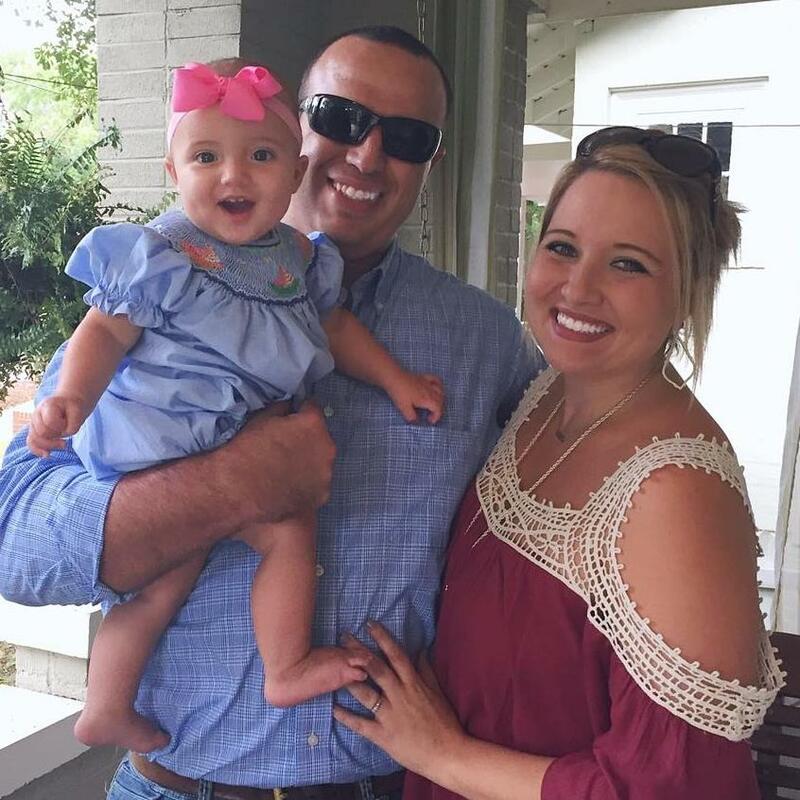 The first few months of motherhood was everything I had ever imagined and more. Our days were filled with baby snuggles, diaper changes, and living off less sleep than I thought was possible. Our house was filled to the top with baby gear, and we didn't touch half of it. I learned quickly that newborns actually need very little to keep happy and entertained. So what does a newborn need? 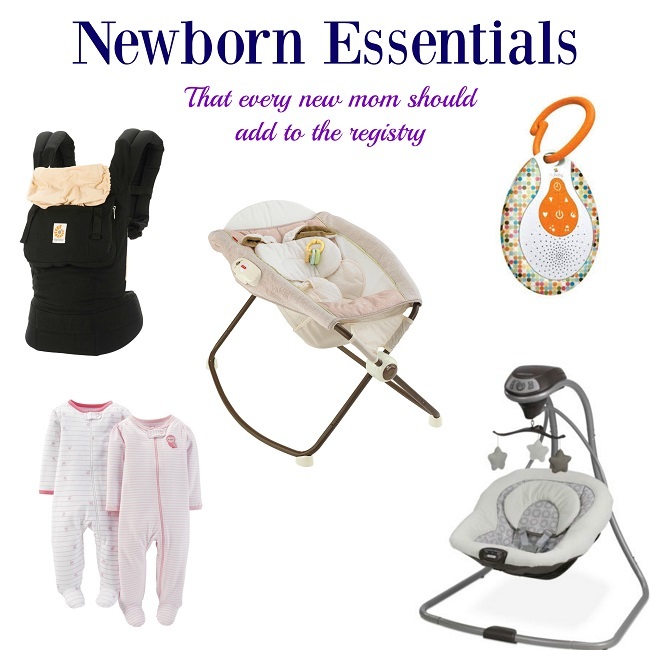 Here are five essentials that I believe every new mom should add to the registry. These are items that we used, and continue to use, on a daily basis. We own a total of three baby swings, that is how much Charlie Beth loves her swing. She has one at home, one at my parent's lake house, and a portable swing that we can easily take with us to the grandparents house or when we travel out of town. Charlie Beth takes all her naps in her swing during the day. I am able to put her in it when she is wide awake and she will lay there content for a little while and then drift off to sleep. I know we'll have to make the transition to the crib for naps soon, but for now swing naps work for us all. I'm not sure I even slept the first three weeks of Charlie Beth's life. We purchased a bassinet that I intended for her to sleep in at night. It didn't work out quite so well. She hated being flat on her back and would immediately wake up the moment I put her down (thanks acid reflux). The only place that she would sleep was on my chest. She was snoozing soundly, but I wasn't getting a wink of rest because I was so nervous letting her sleep there. I finally took to my mom's group on Facebook asking for advice. Nearly everyone recommended a rock n play, so I went out that very day and purchased one. Let me just tell you, it was the best purchase I had ever made! Charlie Beth has slept soundly in her rock n play next to our bed ever since. There were many days during that precious newborn stage that Charlie Beth wouldn't let me put her down for even a second. A baby carrier was our saving grace during those times! My girl loves being snuggled in on mommy's chest, and I'm actually able to get a few things done around the house. When we are at home I put Charlie Beth in the Moby Wrap. She usually falls asleep within minutes. When we are out and about the Ergo Carrier is our go to. I put her in the Ergo when I'm running errands or buying groceries. She loves being close to me, and I love not having her car seat taking up the entire shopping cart! I don't know what it is about the white noise, but it puts our sweet girl right to sleep! I have this portable while noise machine, and I love it. I can easily move it from room to room in the house, and it even clips onto her car seat so we can use it on the go. There is nothing more frustrating than realizing that you've missed a button somewhere when trying to get your crying baby dressed in her pajamas. It happens every single time! It didn't take long for me to realize that zip up sleepers were the way to go. These sleepers from Carter's are the only ones we buy. They are cute, warm, and perfect for those middle of the night diaper changes. They also guarantee that you will never skip another button again! I can not wait until i need this things! These sleepers were the one thing that surprised me after baby girl came that I couldn't live without. I love these so much more than gowns and actually need to buy the next size up soon!! I completely agree with all of these things, although Harper was never a huge fan of any of the swings but everything else YES! It's amazing how many things you purchase that they use for such a short period of time and how many things you'll never think you'll use and it's your saving grace!!! YES to zipper sleepers!! I always mess the dang buttons up. We also LOVE the sleep sacks...our little man always calms right down when we swaddle him in those and goes right to sleep. I definitely need to try more baby wearing. I have all the different ones- we just havent done it much yet! Um, hands up with those zipper sleepers! I didn't have any newborn onesies with zippers and when she could finally wear 0-3 month onesies with zippers, I'm pretty sure angels were singing. Lifesaver! We also could not live without the rock n play. Wyatt is starting to get too long for it, I don't know what we will do! I get the rock n' play for all my new mom friends and they ALL love it. It's the first thing I'll register for when we have our first! Great list!